In Hanoi, it is a truth universally acknowledged that the best pho noodle soup is found in the grimiest restaurants. But in Vietnam eating pho is akin to a religious ritual -- as the late writer Nguyen Tuan said -- and the humble dish, which can be found on every street corner in the capital Hanoi, is integral to people's daily lives. "I have been eating here for more than 20 years," Tran Van Hung said as he stood shivering in Hanoi's damp winter chill in the queue at the Pho Thin restaurant. "The staff here is always rude to me. I'm used to it. I don't care," the 39-year-old said, adding that he was raised on the noodles from the unassuming yet renowned establishment on Hanoi's Lo Duc street. "Pho is purely Vietnamese, the most unique, distinctive dish in our cuisine," said chef Pham Anh Tuyet. "The fragrant perfume of the pho is part of the beauty of the dish," Tuyet, who is famed for her mastery of traditional cooking, said. 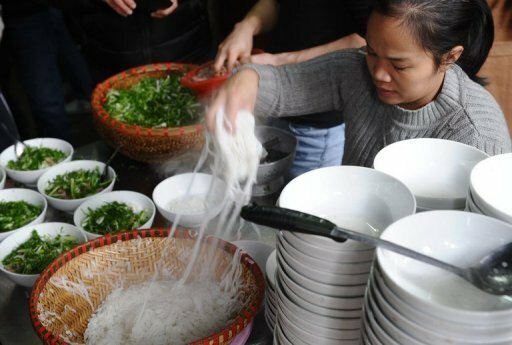 "No other country can make anything like pho -- one of the secrets is the broth, the clear, aromatic broth," she said at her tiny restaurant, tucked away on the top floor of a wood-fronted house in Hanoi's Old Quarter. Beef was not common in Vietnamese cooking at the turn of the century -- cattle were valuable working beasts -- but with the arrival of the steak-eating French colonialists, bones and other scraps became available for the soup pot. Some experts, such as Didier Corlou, the former head chef at Hanoi's Metropole Hotel who has expounded pho's virtues to international gourmands for decades, argue the dish is "Vietnamese with French influence". "The name 'pho' could have come from 'pot au feu' -- the French dish," Corlou said, pointing out similarities between the dishes, including the grilled onion in the French dish and the grilled shallot in pho. Another theory, Corlou said, is that as pho was first sold by roving hawkers carrying a pot and an earthenware stove -- a "coffre-feu" in French -- the name comes from the shouts of "feu?" "feu!" to establish if noodles were available. Yet another argument suggests pho originated from a talented cook in Nam Dinh city -- once Vietnam's largest colonial textile centre, where both French and Vietnamese workers toiled -- who thought up a soup to please both nationalities. But whatever the real story, "pho is one of the world's best soups," Corlou said. "For me Vietnamese cuisine is the best in the world." At his three Hanoi restaurants, for example, he offers a salmon pho as well as a pho au fois gras priced at $10 a bowl -- "you cannot put pho in a museum," he said.